While the crowd was pressing in on Jesus and listening to the word of God, he was standing by the Lake of Gennesaret. He saw two boats there alongside the lake; the fishermen had disembarked and were washing their nets. 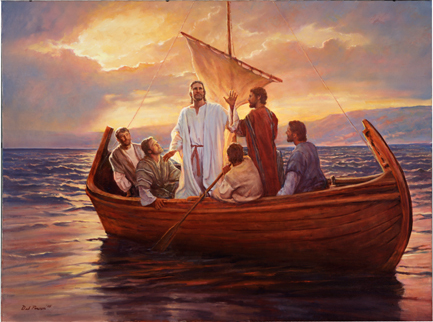 After he had finished speaking, he said to Simon, "Put out into deep water and lower your nets for a catch." Simon said in reply, "Master, we have worked hard all night and have caught nothing, but at your command I will lower the nets." They signaled to their partners in the other boat to come to help them. They came and filled both boats so that they were in danger of sinking. When Simon Peter saw this, he fell at the knees of Jesus and said, "Depart from me, Lord, for I am a sinful man."